Reporter Beth Reinhard Bribed Woman to Accuse Roy More of Sexual Assault-Reported as Fiction! - Truth or Fiction? Reporter Beth Reinhard Bribed Woman to Accuse Roy More of Sexual Assault-Reported as Fiction! Reporter Beth Reinhard Bribed Woman to Accuse Roy Moore of Sexual Assault-Reported as Fiction! 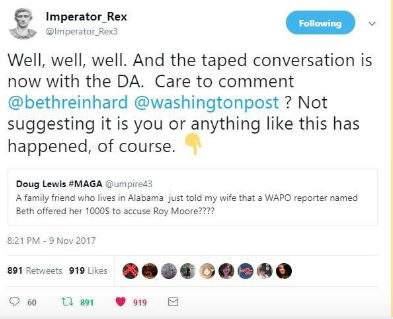 Washington Post reporter Beth Reinhard bribed women to accuse Roy Moore of sexual assault or molestation, offering them $1,000 to bring false allegations. There’s no evidence to support claims that Beth Reinhard bribed women to accuse Roy Moore of sexual assault or molestation. Those accusations surfaced following reports that GOP Senate candidate Roy Moore had sexually assaulted underaged girls in Alabama. The Washington Post broke the story, and claims that reporter Beth Reinhard bribed women to accuse Moore surfaced almost immediately. False reports that reporter Beth Reinhard bribed women to falsely accuse Roy Moore of sexual assault circulated on social media in November 2017. The idea that the Post reporters contacted the women gave rise to the idea that reporters persuaded — or paid — Roy Moore’s accusers to sway Alabama’s Senate race. However, there’s no evidence that Beth Reinhard paid Roy Moore’s accusers to come forward. The fallout from the Washington Post story was immediate. GOP leaders walked back support for Roy Moore. Alabama’s Senate race tightened. And critics of the Post went to great lengths to prove that the story was a hit job. First, robocalls from an alleged Washington Post reporter named “Bernie Bernstein” were placed throughout Alabama in early November. The recording claimed that the Post was offering $10,000 for women to accuse Roy Moore of assault. However, it was part of an unnamed group’s campaign to smear and discredit the Post. Rumors that Beth Reinhard bribed women to accuse Roy Moore of sexual assault next took an even more unusual turn. A woman working for “Project Veritas,” a non-profit funded by right-wing groups to investigate and expose liberal bias in news and government agencies, approached the Post. The woman falsely claimed that she’d been sexually assaulted by Roy Moore as a teenager. She also falsely claimed that Moore impregnated her and forced her to have an abortion. Beth Reinhard maintained contact with the woman for months, but the paper never published her allegations. Key elements of the women’s stories didn’t check out in its fact-checking process. After more investigation, the woman was revealed to be a Project Veritas plant making false accusations. In the end, there’s no proof that Beth Reinhard paid women to accuse Roy Moore of sexual assault. Tyler Perry and Oprah Winfrey Giving Away Gift Cards on Facebook-Fiction!